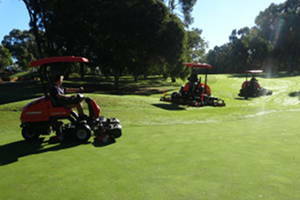 Mandurah Country Club, 70km south of Perth has recently had an exciting new addition to the Jacobsen machine family. The Jacobsen AR722T Contour Rotary Mower is superintendent Shannon White’s new favourite toy and the first one to be used on an Australian golf course. The seven-gang rotary mower is equipped with a 65.2 hp turbo-charged diesel engine that provides power to the TrimTekTM decks and SureTracTM four-wheel drive traction system, perfect for a contoured cut. Shannon has been in his current role for nearly four years and has maintained a strong relationship with McIntosh & Son, Jacobsen’s WA dealer. Industry veteran, Mike Healy of McIntosh & Son was a previous superintendent at Mandurah Country Club, so he knew that the AR722T would be a perfect fit for the course. Shannon first saw the AR722T on the GIS trip in Orlando and says he could see just by looking at it, that it was a good machine. 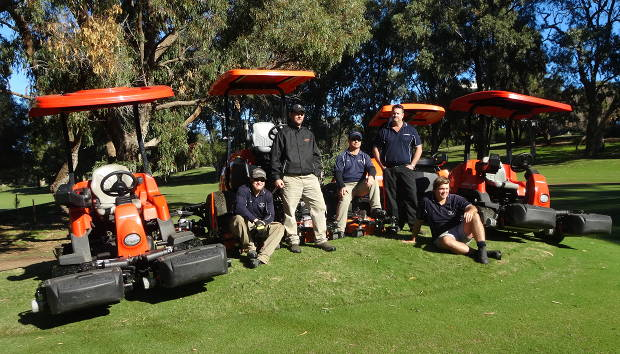 He feels that after seeing the results of the AR722T on his course, Mandurah’s commitment to the Jacobsen brand is stronger than ever. “We had always had bits of Jacobsen gear and there is no denying that Jacobsen have always had the best cutting units. 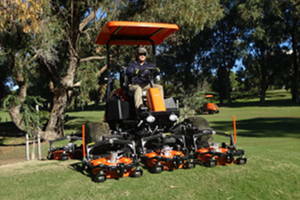 Shannon says that while it used to take two machines to cut the course, the Jacobsen AR722T has enabled them to complete the job in half the time they used to, with only the one machine. “Getting a 722 it has allowed us to free up a machine and a man, and we are still cutting in less time than we were before. Shannon feels as though innovation in greenkeeping is very important to him and Jacobsen as a company are on board with that idea. With sustainability being such a big thing in golf at the moment, Shannon states they have to have machinery that does the job the best and quickest way possible. “Being able to adjust your rate of cut is so unique to Jacobsen machines. “Obviously being a private members course, members expect a good surface and we have really found the improvement in the greens surface with the new Eclipses. “With the 322’s we can cut less and we are getting more grass clippings off, so you’re not putting the strain on the greens by running over them all the time, but you can get the same result with those mowers as if you were cutting more often.